This image comes from Vanessa Otero and can be found on her website. It is becoming clear to me that it is no longer possible to get all of one's news from any single source and feel like one is not only not missing anything but that one is getting reasonably accurate information. Multiple sources are required to obtain the full picture and avoid confirmation bias. I have grown tired of much of the hyper-partisan narrative-over-facts approach that seems so common, and so I decided to do something about it. When it comes to cable TV news, I watch roughly the first 30-45 minutes of the PBS Newshour most evenings, turning it off before they devolve into the human interest stuff in which I usually have little interest. Aside from that, I steer clear of cable TV news unless I am curious about how a particular story is being presented on MSNBC, Fox News, or CNN. I have set up my RSS reader to pull news from several high-quality and relatively unbiased news sources (e.g., The New York Times, The Washington Post, Reuters, NPR, the AP). These make up the core of my news sources. I then supplement these sources with a few reputable left-leaning ones (e.g., The Atlantic, Slate) and a few reputable right-leaning ones (e.g., The Hill, The Fiscal Times). 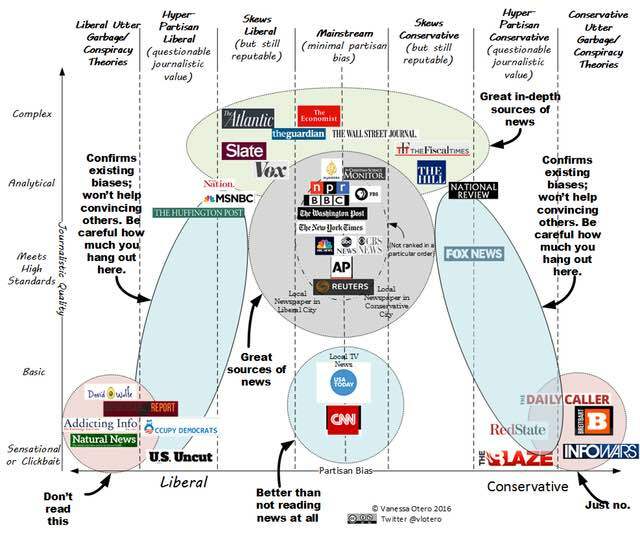 I steer clear of the less-than-reputable sources from both the left (e.g., Addicting Info, Natural News) and the right (e.g., Breitbart, Infowars). Finally, I am working on adding a few international news sources to round things out. I make no claim that this system will work for you. I'm not sure it will work for me since I only started implementing it about a week ago. Time will tell, but I thought it was worth a try. Update: the graphic above was updated in February of 2018.